UDM Downloads > Advanced Team Scheduler! Product Description Useful for people who organize team sporting or game events. It can organize an unlimited number of teams for an unlimited number of games. Simply fill in the requested information into the wizard like interface, and Advanced Team Scheduler automates the season, tournament, league, match, round-robin schedules. A great first step and time saving tool for anyone who does alot of match scheduling. Advanced Team Scheduler can schedule games with any user specified combination of dates and times, regular or irregular. The scheduler gives you complete control over all aspects of the schedule, and creates solutions effortlessly and elegantly in accordance with the user data entered. Scheduling Algorithms and supported schedule types Intelligent scheduling time generation algorithm to produce schedules with a more efficient and compressed chronological ordering. Uses a constraint logic programming algorithm (modified canonical pattern) by mathematician Dominic de Werra as a schedule basis, prior to any hard constraint adjustments. Support for single or multiple round robin schedules, custom, single or double elimination tournaments. Schedules can vary wildly over dates, i.e. 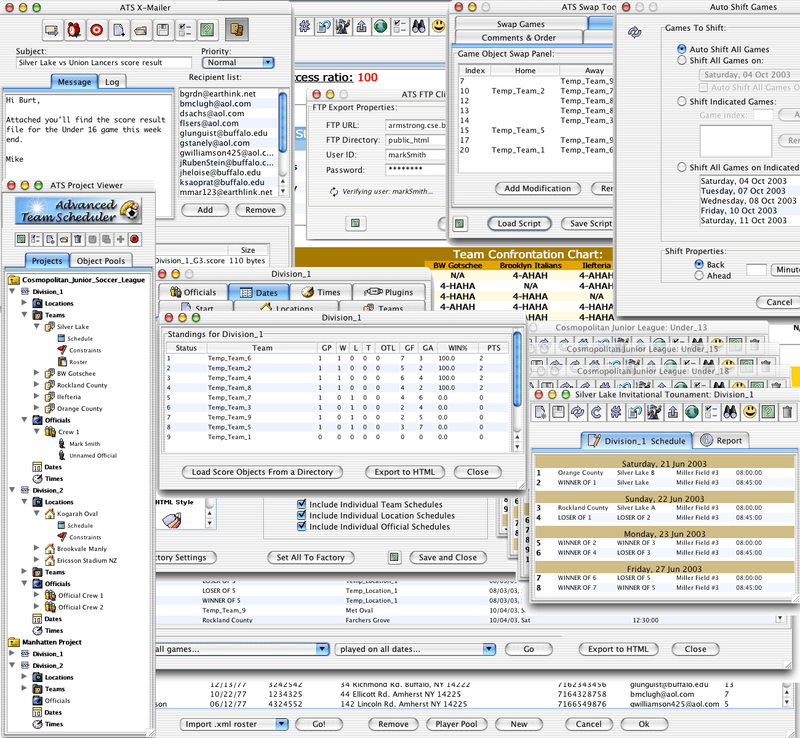 games can take place on a Monday and Tuesday of the first week, Wednesday, Thursday of the second week and Friday and Saturday on the third week and can be accomplished without too much data entry Support for groupings of multiple schedules in order to track conflicts and manage inter-divisional play. Support for team or location specific constraints. Schedule evaluations Detailed interactive reports for every schedule that can respond to changes made by users directly in the schedule tables. Reports include, schedule quality ratio score, number of games per team, number of home and away games, home and away patterns for each team, a confrontation chart depicting the number of games each team plays against it's rivals, and the home and away pattern for rivals.